Adventures in Home Automation: Another example of why monitoring is a big part of home automation. Another example of why monitoring is a big part of home automation. As mentioned in Monitoring: the often overlooked automation. I was alerted my Rachio was offline by Homeseer monitoring my Rachio. 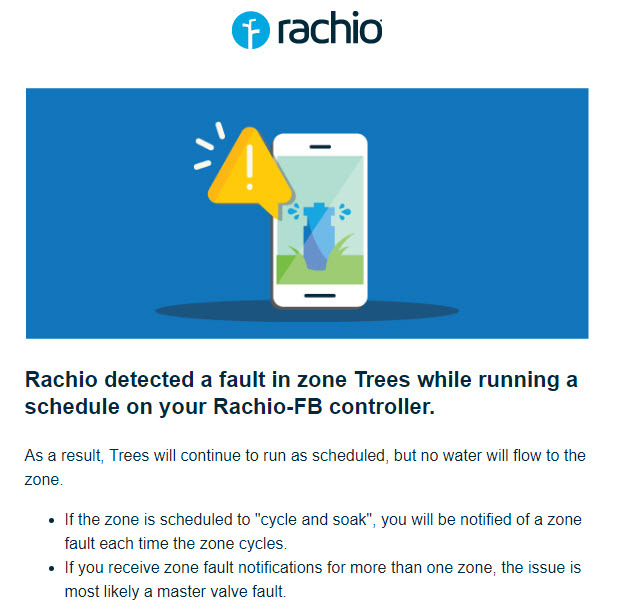 Today I received an email the Rachio had detected an issue with one of the solenoids it controls. This lets me know to go check it, and this case replace it, before the plants start showing distress. SmartThings FAQ: Hub limitations on Number of Devices? Who’s Afraid of the Big Bad Hub? Wink vs SmartThings in 2018 – What Has Changed? ZigBee, Z-Wave, Thread and WeMo: What's the Difference?